Cyclists - like a challenge? There's one for you here, whatever your proficiency level. Willow Wood is once more proud to announce that we're partnering with the Tour de Manc, to ensure that we can provide the very best cycling experience for our supporters. There are four routes so whether you cycle for fun and fitness or like a real challenge there'll be one that's right for you. Although the distances may not be as long as some other cycling challenges, the routes are planned to incorporate some significant hills which will really test your stamina. All routes will be well signed and there will be a mechanic out on the roads for minor repairs. 1-8km: A 1km flat cycle track - suitable for young or inexperienced cyclists who can choose their distance on the day. Register now for a great cycling challenge and a great way to raise funds for Willow Wood. 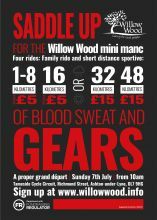 And if you're up for a longer, more challenging ride, you can take part in the Tour de Manc on Sunday 5 May, and still raise funds for Willow Wood. There's a choice of the Full Manc at 100 miles or the Half Manc at 100 kilometres. Find out more and register now at tourdemanc.co.uk.